This is just a quick update post – I apologize for the lack of detail as I’m trying to type while wearing my new fingerless gloves as it is very cold sitting in the little annex of our tent. We are now in Mt Isa and some of the caravan people who visited us this evening, to make sure we were okay, told us that frost is forecast for tomorrow night. We’re glad we went shopping for some extra warm gloves and beanies today – I’m never going camping without a beanie again! Its hard to know where to start with Lawn Hill …. there have been three good wet seasons there and many species are enjoying the available food. 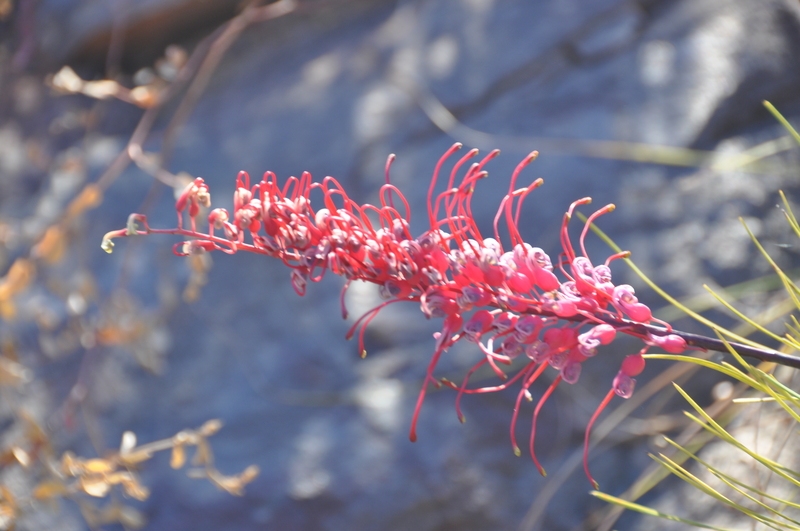 The Grevillea flowers look beautiful, especially so when there are honeyeaters working them over and the variety of seeding grasses is a bounty for finches and doves. 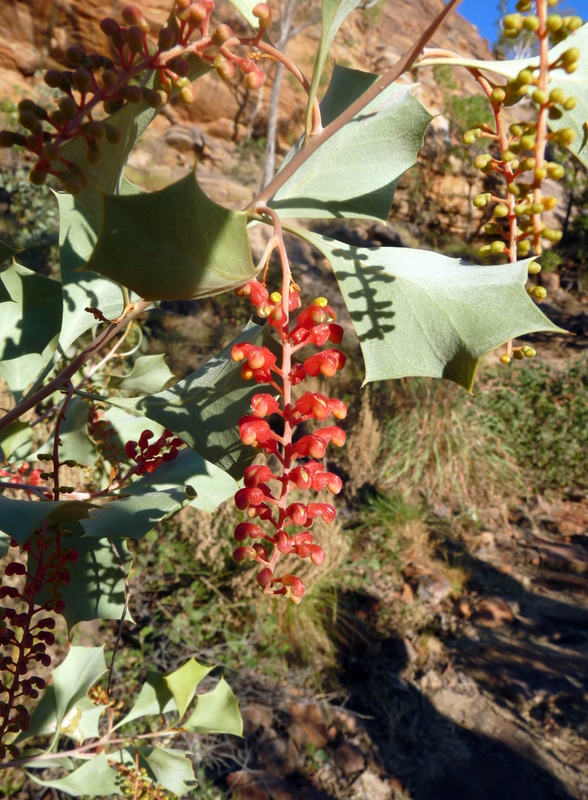 Grevillea dryandri grows on rocky slopes amongst grasses and boulders, as does the holly-leaved Grevillea wickhamii in the second photo below. 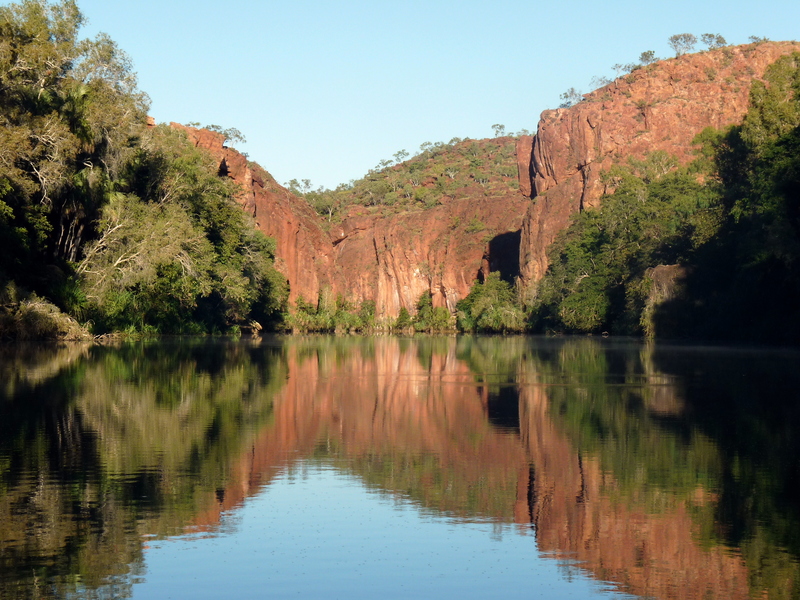 This is a typical morning photo of the gorge – we were the first to hire a canoe that morning and it was just magic ….. a family of Sea Eagles took off from their sunny ledge near the top and soared over the water. 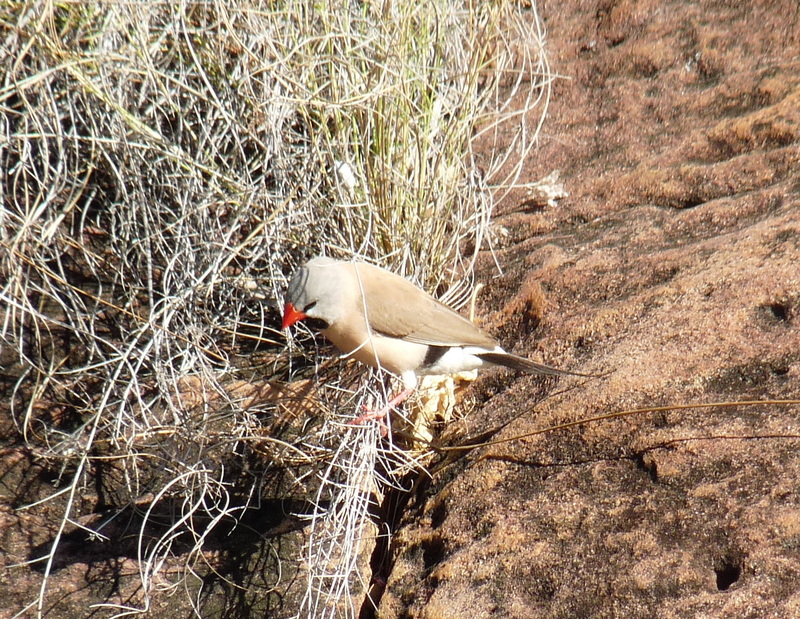 We watched Fairy martins busy rebuilding their nests beneath rocky overhangs, Paperbark Flycatchers hunting for insects and this delightful Long-tail Finch collecting nesting material from a plant growing on the cliff. All the people we met at Lawn Hill were appreciating the beauty of their surroundings, there were lots of happy faces and a lovely friendly atmosphere……perhaps the Rainbow Serpent was looking after us all or was it a certain bonding we all felt over the cold showers available in the amenity block! This entry was posted in Excursions and tagged Grevillea wickhamii, Lawn Hill, Long-tail Finch. Bookmark the permalink. It sounds like a perfect trip – until your mention of the cold showers! Beautiful photo of the Gorge. The weather wasn’t so cold when we were at the Gorge – most days we had a swim so most of us had showers when it was still warm in the late afternoon and it was okay – especially when you were wrapped in a towel afterwards! It is a wonderful trip and we’re now inspired by others’ travelling tales to explore further! I could actually do without the novelty of feeling really cold but now that we are better equipped we are feeling more comfortable – we are just loving the opportunity to see the country looking so good after a few good seasons. You would love the flowers Ian! Brrr, and we were thinking it was cold here…. I bet you are even sleeping in your beanie 🙂 Gosh I can just imagine a canoe ride at dawn on that calm water. I love the sunbirds on the greyvilea and just moved ours into a more open area so we can watch them. Stay warm. Well actually we did sleep in our beanies last night and it made a big difference!